State Rep. Silvana Tabares, D-Chicago, recently hosted a free Child ID and Medical ID Program to offer parents free resources and help to be prepared for serious emergencies involving their children. “I want to make sure families in my district are prepared for serious health or safety emergencies,” Tabares said. “This event provides families a proactive way to make sure their children are safe and their medical information is readily available for first-responders.” Tabares partnered with the City Clerk’s office to help parents enroll their children in the Child ID program to share their vital information, picture and digital fingerprints with law enforcement, media and various child protection and child search groups, if the child becomes lost. Residents also received free medical identification cards to those who wanted their medical information and vital statistics readily available for first-responders. For more information about this event or upcoming events, please contact Tabares’ full-time constituent service office at 773-522-1315 or email rep.tabares@gmail.com. 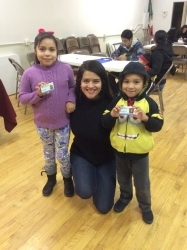 PICTURED: State Rep. Silvana Tabares (center) visits with two children as they pose with their new identification cards from the Child ID Program Tabares hosted Friday, Nov. 13 at the Little Village Community Council.